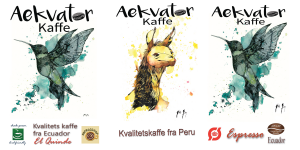 Here you can find some more information about aekvatorkaffe in english. Since 2012 , Aekvatorkaffe , a danish based company , has been brewing and selling quality specialty coffees from different parts of world. 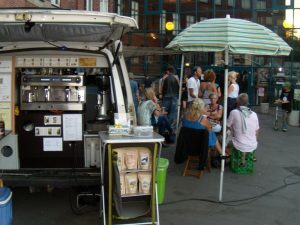 We started with a mobile coffeebar , a VW T4 california coach , and made exceptional coffees for festivals and markets. In 2013 we bought our first coffee roasting machine , a quality machine that was made in South Africa , that was shipped and installed in Danmark. First the roastery was located in the small town of Flemming , and in 2015 we moved our facility to the cosy town of Vejle in the centre of Jytland. Early event : ‘Made in Esbjerg’ in 2012 . In 2013 we started importing directly from our coffeefarm , El Quinde , in Ecuador, where my brother , Michiel , is growing coffee since 2008. He grows arabica coffee , Caturra and Tipica varieties principally . Where there first was grassland with cows , he started digging 40 km of terraces and planting trees to restore the original forest. Later he came up with the idea of planting coffee trees in the new shade. Coffee is originally an understory bush from rainforest anyway, so it was a good combination. Today there are more than 25.000 coffee plants in the El Quinde farm and forest reserve. Now, after nearly a decade of coffee growing and land restoring many hummingbirds and other species have returned, enjoying the space. In the Tandayapa Valley, where the farm is located, which is a one hour drive from Ecuador´s capital, Quito, there are several other coffee farms which are working with the same kind of concept. Brian from Cloudcoffees wrote this great i article in the online blog perfect dialy grind . We work on constant developing the quality i Ecuador , USA and Denmark. 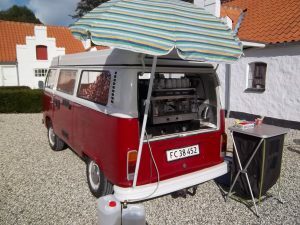 In Danmark we offer freshly roasted coffees at your doorstep served from our VW California Coach from 1977 . 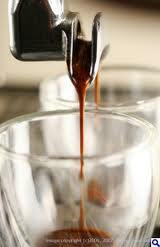 We brew high quality coffee as espresso, capuccino, latte or cortado. If you are more into tea, than we have different kinds of organic tea and we make different hot chocolate drinks from Whittard . You can hire our coffee bus for your party, marriage , school or business event so we can serve you the best coffee, tea or hot chocolate for your guests . We are located in the centre of Jylland, but we can be hired all across the country. Just call or mail us for a cost-estimate. We also organize coffee arrangements for your party or business, where we can do some coffee tasting (cupping) together with the participants. You will become acquainted with the widely different flavours, and we will tell something about coffee’s history and its oddities. 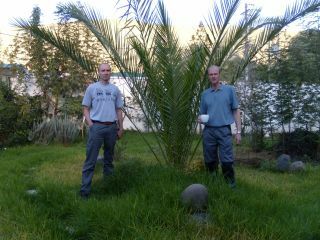 Highland Coffee is not just about Coffee cultivation. One can not separate agriculture, not even agro-forestry, from ecological or social aspects, amongst others. Especially in this region, where flora and fauna are present in great abundance; the area is considered to be number eight on the list of ecological hotspots in the world. Coffee is one of the few alternatives that can be combined with nature conservation. It is considered a way to restore the biodiversity of badly managed and degraded land, forming a buffer-zone around the isolated private and public natural reserves. The subtropical highland forests represent a healthy and rich habitat, not only for mammals and plants, but also for the increasing local human population. The highlands produce a high quality of Coffee found only in a few places worldwide. Furthermore, a recent study performed by Nestlé determined the region to be most suitable to produce the best specialty Coffee in the world. The health of the environment is reflected in the health and quality of the Coffee product. Overall, it needs to be stressed that in order to be able to produce this high quality product, one needs to act with care and in a sustainable way, which can only be guaranteed by managing the area in an integral manner, where all aspects of life are perfectly integrated, like social, ecological, productive and economic activities. Therfore the choice of ecological sustainability, goes hand in hand with the productive sustainability. The economics of a Coffee culture also values the ecological dimension, directly through methods of green fertilizing, but also indirectly by guaranteeing that care is taken to not adversely affect the natural environment. It is obvious that this will have a negative effect on the quantity of the harvest, because of the maintenance of shade trees and other native tree and plant species as part of the Coffee culture. On the other hand, this will greatly increase the quality (organic certification, taste and aroma) of the product, and can compensate to a great extent the economic sacrifice that was made in favor of a healthy environment. Secondary products in a highland shade organic Coffee plantation are forest-related products and, several fruits for local consumption .Moreover payments are made by external parties as a compensation for the carbon offsetting in the coffee trees and natural forest that surrounds the plantation. It is time for both the coffee grower and the coffee consumer to become ecologically responsible.